Selling your boss on an idea isn’t always the easiest thing to pull off. Perhaps you break out into a sweat at the very thought of it. Especially when that idea means asking for more budget, so you and your team can start using software that will make you more effective with your work while meeting revenue objectives. RFP software has many names. Proposal management software is one of them. 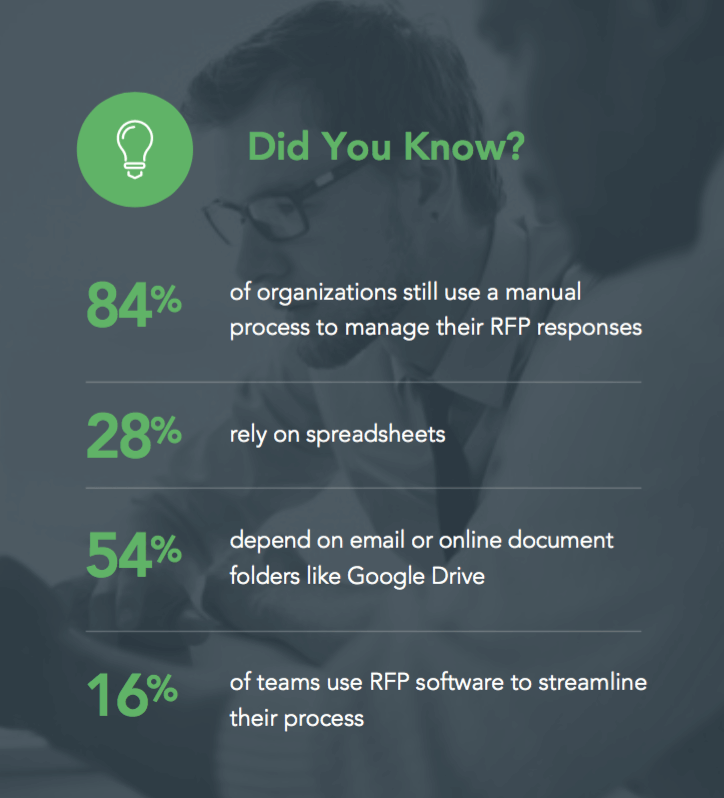 RFP response automation is another. Now, with RFPIO, we’re using the term “response management platform” to cover the various use cases our software can handle beyond RFPs. We’ll leave it up to you on what you call it. But, we won’t leave you on your own as you prepare for the upcoming RFP software budget conversation with your boss. Here are some tips to help you succeed in selling your boss on a fantastic solution like RFPIO. Over the past ten years, most business cases I’ve seen for tools like RFPIO focus on operational efficiency. Time-savings top the list and are the easiest to quantify. This cuts across the whole RFP response process, from project tracking to finding and validating content, from collaboration to project management, from importing to formatting the final document. Secondary soft benefits like consistency, accuracy, and mitigating risk (such as knowledge walking out the door) are good for reinforcement. The “problem” with this justification is even though the investment required to address the need is modest in the scheme of things, you no doubt have dozens of potential projects and investments to consider across the business at any moment in time. Which projects are most important and are likely to be funded? Even if this is a budgeted expenditure, there are still people and process considerations. And a company’s finite resources must be prioritized. That means it may be more of a matter of “when” not “if.” But that doesn’t help your RFP team who must continue to endure long and stressful days, right? Which of our corporate initiatives does this investment support? What is the ROI and over what time period? Question #1 speaks to the “why.” Time-savings are great for the RFP team, but time-savings are often conflated with cost-savings. And that isn’t necessarily true unless you can reduce headcount or eliminate a future hire. The key is to focus on the role of the RFP/proposal from a more strategic point of view. The acid test is this: Is a proposal considered by management to be a “necessary evil” or a critical selling document? If the former, it’s an uphill battle. The most common pushback is a proposal is just one part of a complex and lengthy sales process. That is true, and the best proposal in the world will not win you the deal on the spot. But a poor proposal will likely cause doubt in your client’s mind. At best, this will extend the sales cycle. At worst, you lose the deal. A good proposal provides the opportunity to encapsulate everything you have learned during the sales process. It should articulate your understanding of the client’s underlying needs, how you will address their requirements and solve their business problems, how you will add value, and ultimately why they should choose to work with you. Even with the best intentions, the main constraint is time. RFP response due dates are deadlines, not guidelines. With tight submission timeframes and multiple RFPs being worked on simultaneously, you don’t always have the luxury of enough time to produce the best possible proposal. Aha! So now time-savings do matter. For sales teams, time is also a valuable commodity. Any opportunity to spend more face-time with clients and/or focus on other revenue-generating activity helps them to achieve their revenue goals. If your RFP team could gain an extra week in the process and invest that time in improving the quality of your response, this will contribute to higher win rates. If the burden on SMEs (subject matter experts) and management were reduced so they could focus on other operational priorities, imagine what this could mean for the greater good of the business. We won’t tell you to prepare for the worst when you’re approaching your boss or budget gate-keeper, but we will tell you to be prepared. Let’s return to the three potential questions you might hear from a CFO to brace you for that upcoming RFP software budget conversation. 1. Which of our corporate initiatives does this investment support? An investment in proposal quality converting to more business will clearly support many of these objectives. 2. What is the ROI and over what time period? Unless there are headcount considerations, it makes sense to incorporate efficiency gains, but focus on business outcomes. In other words, quantify the revenue upside. How many proposals did you produce this year? How many RFPs do you expect to respond to next year? What is the average $ value per proposal? Multiply the two. That’s likely to be a big number. So, win or lose, proposals influence hundreds of thousands—if not millions—of dollars of business for your company. If you could win just one more deal a quarter through improving proposal quality, this RFP software investment will pay for itself many times over. Or if your win-rate went up from 25% to 30%, think about the additional revenue that could be generated. There’s your ROI. 3. Why do it now? Unprepared, question #3 can be the hardest one of all. But if the answers to #1 and #2 are well researched and articulated, why wait? 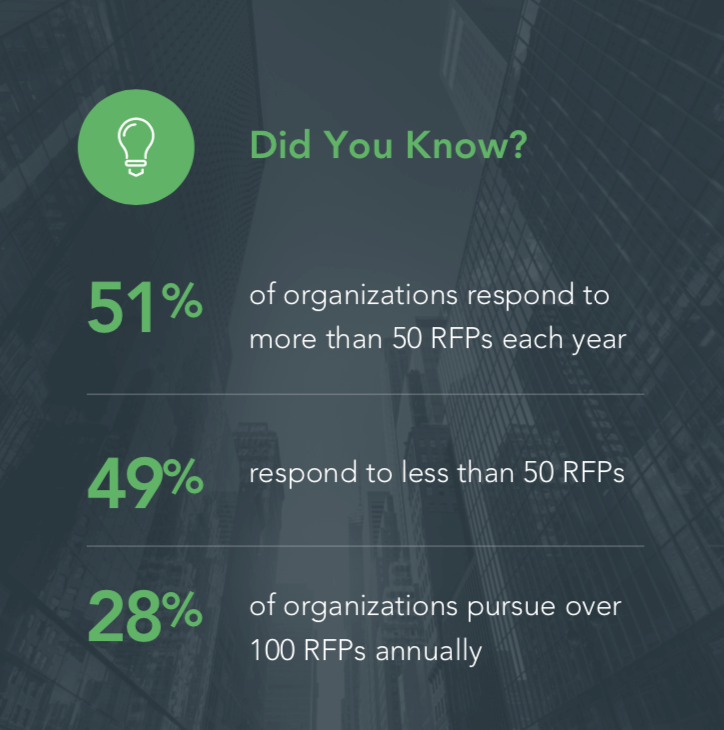 On average, half of organizations respond to more than 50 RFPs annually. You’re already generating so many proposals a quarter—there is a lost opportunity cost here. Regardless of the significant business impact addressed above, a solution must offer value for money and fit in with your budgetary constraints. Here are some pointers on where RFPIO compares favorably with other solutions. RFPIO’s pricing structure is not seat-based. Every pricing tier includes unlimited users. This is to promote wide-scale adoption and ensure that all the time-saving benefits of collaboration and tracking can be realized. If you need to revert to email to facilitate collaboration because of user license limits, you limit the impact of the tool. As you roll RFPIO out, the primary price consideration is the growth in the number of concurrent RFP projects, which will likely cost less than adding seats. RFPIO is also designed to be very easy to use—meaning the training overhead for new users is minimized. Everyone can jump right into their first RFP project quite easily. Without automation, knowing where to look for reusable content and verifying whether the content is accurate, relevant and up-to-date is one of the most time-consuming aspects of responding to an RFP. RFPIO’s answer library is designed to make it easy to load, manage, and find the best content to use for a given project. Without automation, the process of allocating questions or sections to people for completion or review is a major time drain—not just for the RFP team but for all the subject matter expert contributors involved. RFPIO streamlines this from the initial importing of client documents to the assignment of sections/questions, to the workflows involved in completing and reviewing answers, to the whole dashboard tracking of the project. Handling Word files is relatively straightforward for most tools. However, handling complex multi-sheet Excel workbooks makes the process of responding and collaborating very challenging. RFPIO makes it easy to import, collaborate, compete and export back to the source, saving significant time when working on Excel and Word-based responses. This takes many forms from overall project visibility, company-level assessment of RFP team activity and impact, audit trails at Library and Project level. The reports and dashboards in RFPIO are automatically created/maintained, many are actionable (click on a chart to dive into the response) and can save many hours tracking progress. RFPIO allows you to output into either the source document for Word/Excel or a branded Word template, again saving time in the formatting of your final deliverables. RFPIO provides optional integration with CRM systems (such as Salesforce.com and Microsoft Dynamics), Single-sign on processes, cloud-based storage services (Google, Box, Dropbox, One-Drive) and messaging tools like Slack are also included. These savvy integrations can save additional time in avoiding duplication of data or content. RFPIO is a low-cost, low-risk investment with significantly high business impact. On average, our customers report time savings of around 40% when comparing RFPIO to existing manual methods. This is the last thing we’ll leave you with, so you can seal the deal with your boss or budget gate-keeper. 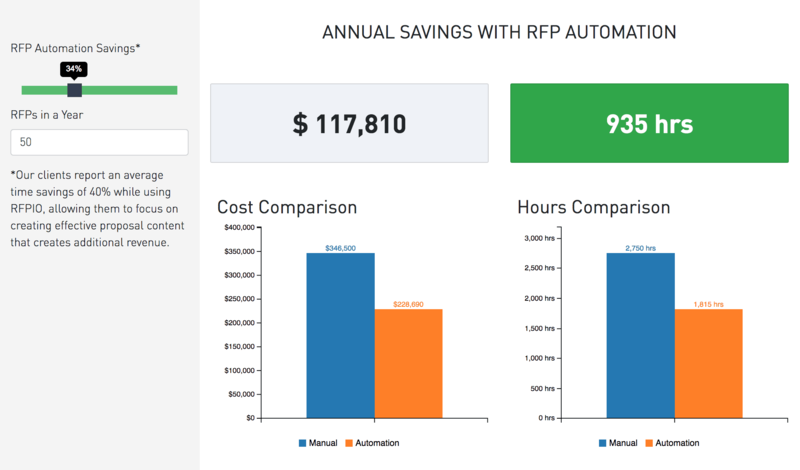 Use our ROI calculator to see how much your organization can save with RFPIO. Cheers! David is a Senior Sales Director at RFPIO. He has over 30 years of international sales management experience predominantly in the enterprise software space, while working and living in the UK, US, and Australia. 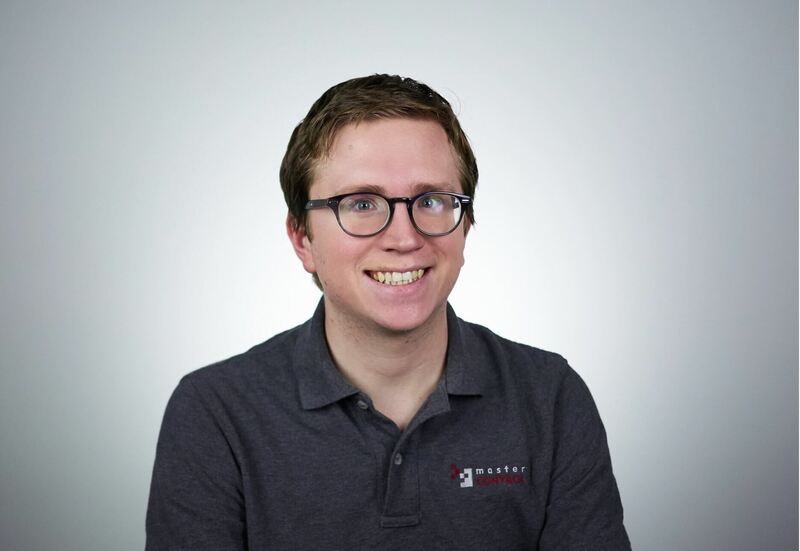 Since 2001, David has been focused on sales effectiveness, specializing in RFP response and sales proposal automation. Connect with David on LinkedIn.